Briefly, it's a "Think Of A Card" concept that requires no props at all. You don't even need a deck of cards. A spectator is asked to merely THINK of a number from 1-10 and to NOT TELL YOU. Once she has done this, she is asked to think of a suit and again to NOT TELL YOU. Then, ENTIRELY IN HER MIND she adds the suit to the number to create a visual image of a playing card. Again, SHE SAYS NOTHING! Once she has confirmed that she is thinking of a card that NO ONE CAN KNOW, you then proceed to reveal the card in any number of ways. You ask the spectator to concentrate. You then reveal her thought-of card with 100% accuracy. It's that simple. Once you know the method you'll be able to do this at any time. In fact, you'll be doing this for the rest of your life. It is that strong and so simple! You discuss cold war exepriments in which psychics were tested to see if they could make enemy maps become blank and useless. The spectator is handed a deck of cards BEFORE YOU BEGIN. She is NOW asked to think of a card WITHOUT SAYING ANYTHING. When she has confirmed that she has a card in her mind, you ask her to imagine it "fading way" slowly. When she confirms that her mental image is gone, she is asked to take the deck and to remove her thought-of card. She attempts to do this, and counts the cards. However, there are ONLY 51 cards and her though-of card IS NOT THERE! The amazing thing about this is that she NEVER REVEALS THE IDENTITY OF HER CARD AT ANY TIME! This is Ben's favourite handling and what he is using to close his professional shows. A deck is shuffled face up and face down by a spectator, spread upon the table and covered with a sheet of newspaper. A knife is introduced and the spectator is asked to THINK OF A CARD. Once she has done this, she is asked to imagine the spirit of the card flowing down her arms, through her wrists, into her hands and finally into the knife. AT NO TIME DOES SHE REVEAL HER THOUGHT OF CARD. The performer now takes the knife and lunges it through the newspaper. It stands proud for all to see. Now, for the FIRST TIME, the spectator announces her thought-of card to the audience. The knife is ripped from the newspaper and is seen to be IMPALING THE VERY SAME CARD. There are no switches, the thought-of card is genuinely stabbed, each time. So, what could possibly be next from Ben Harris. Crossroads was an absolute show stopper and would be very hard to follow up. So with silent running were promised that the spectator thinks of a number which they never say out loud. True. They then think of a suit which they never say out loud. True. They then marry the number and suit up to make a card which they still don’t say out loud. True. Nothing is written down. True. Despite all this, you can instantly reveal their card to them seconds after they have thought of their card. True. 100% true. Practical. True. Commercial. True. Something you will use often. Most defiantly True..... Can you see what happening here? What sounds like false advertising is 100% true. You can tell this is going to be one of the most talked about methods in mentalism this year purely by the list of names commenting on it. Banachek, Marc Paul, Nathan Kranzo, Peter Duffie, Marc Spelman, Devin Knight, Dee Christopher and the list continues! So, the review. It’s easy to see how this effect has progressed from the legend of an effect that is crossroads. Again, the usual Ben Harris quality. Instantly thrusted into the Foreword by Looch. 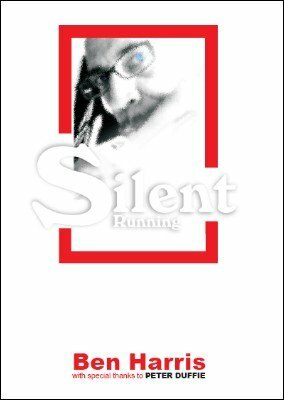 He takes us through his stories of using Silent Running and gets you motivated to keep on reading. Onto Ben’s introduction. Introduce “Duffies Dodge”. What on earth? Ben really gets you thinking. Apparently silent running, born from crossroads and utilizing a hidden tool from Peter Duffie. Lets move on quickly and get to whatever this Dodgy Duffie Dodge could be! Much like the support act at a heavy metal gig hypes up the audience, Ben still holds back the secret as he explains why where and when the trick came around. Explaining the extent to which this trick will fry an audience. Then finally, after i’ve been thrown about in the mosh pit of Ben Harris’ mind, we delve into the method. Might I say, Wow, What a method it is. I’ve used countless methods for a deck-less method for learning a spectators card. One that was practical and looked like real mind reading. I must admit, some methods came close but non came close to Silent Running. Ben goes into stunning in depth explanations of the processes you need to go through to get to the stage in which your ready to reveal the card. The best part about Ben’s method is, it looks and feels like real mind reading. Mad, I know but unbelievably true. To know that what I had to ask the spectator to do was think of a number from 1-10 then think of a suit and lastly keep that card in their mind.. and STILL have a 100% hit rate was an indescribable feeling. For those who think there is something missing for what i’m saying or am trying to cover an extra little part of the process, i’m not. The selection process might throw up one slight issue for some magicians but, when thought about logically, here are VERY simple ways to abolish the subtlety that Ben has placed in. After performing the effect, I LOVE Ben’s subtlety and think it means that everything will go perfectly every time but realize, in all honesty, some may wish to walter it slightly. Ben get’s us to the stage in which we are ready to reveal the selected card. Enter: The Routines. Ben begins with a version of his much loved Crossroads effect. So now, those of you with Crossroads will already have the deck ready to go. Those without, Ben still explains what you need. Imagine, having a card THOUGHT of. The deck is opened and without them saying a word, it is the ONLY card in the deck missing. Then it’s produced form wherever you so wish. Sounds to crazy to be true right? Well yeas it does sound to crazy to be true, but it is. I loved Crossroads so much and it’s become a stable part of my card act, now, ill use it even more often. Every deck I won will be a crossroads deck so that i’m always ready set go for Silent Running if I need it! Second we have Ben’s direct mind reading approach. His brilliant system for revealing the card without any props. This is a fanatically thought out piece of script. Seriously cool. Everything seems fair and you have a 100% hit rate every time. Alternatively, Ben shows you a fantastic way to adapt it to a pad. Giving you another way to reveal everything in a fair and clean way. Ben’s last routine is a brilliant take on the cards on table stab. This allows you to spread a genuinely normal deck on the table. Place some news paper on the spread cards and then plunge a knife into the paper, thus impaling a card on the knife on the other side of the paper. The paper is removed, the card is shown to be the thought of card. Again, Clean. Ben’s method is sublime and incredibly practical. I’ve never performed this kind of effect before, but with Silent Running, I have no reason not to perform it. Everything is brilliantly explained in depth and with clear photos. End Routines. Enter Appendix. This section of the book teaches you how to make a Crossroads deck that works with Silent Running. As well as this, all templates and diagrams that are mentioned in the book are added here. Again, brilliant detail and the original Duffie Dodge is explained here in depth! Last section of the book are the contributions from other magicians. Good times indeed. The highlights of this section are Bob Cassidy’ suggestion of performing it for two spectators. This makes it even simpler and even more direct. Not to mention, more magical. It’s a small thing that makes a huge impact. Paolo Cavalli’ Court Card illusion is another simple but brilliant idea that will make everything seem just that bit more amazing. Devin Knight offers some brilliant work on a popular method in mentalism. It is genuinely priceless information that will put those people who are uncomfortable with it completely at ease. Another invaluable piece of advice that can be used for so much more then the original Silent Running effect. Steve Shufftons work with Silent Running and a deck is also gold. A brilliant way to end the book. The reason i’ve not gone into depth with the Bonus section is I believe that this method is so versatile that so many magicians will be coming up with their own interpretations with it. I myself have already come up with countless ideas with it and I know Ben has hundreds more. This method will soon transcend that of just cards and move onto other forms of mentalism. This really is one of the best methods for a thought of card that will have nearly any mentalists buzzing with joy. It’s a practical, workable and truly remarkable method. The products quality is amazing and those who complain that the book or PDF is of a high value for just one effect, it’s not necessarily about the singular effect but the sheers amount of idea’s and effects you can add it to. If you use this trick more then 5 times, the book has paid for itself. The book is quality and I’m more then proud to have it in my collection. Ben has excelled himself with Silent Running and i’m certain we’ll be hearing lots more about it.